The main story revolves around Rachel, who is filming a documentary about the grizzly murders from the first film. 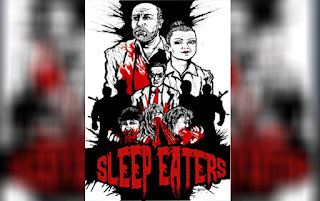 The opening of this film is actually the opening of the documentary in the film, which takes us through the events of Eater to catch viewers up on the tale of "Cannibal Kelly," who has been on the run for over a year, desperately trying to keep himself from falling asleep and eating. Naturally, his efforts are for naught, and after Kelly wakes up after a night of feeding and finds himself in the company of a lonely guy named Reggie, the two pair up against a family of hillbilly, gun-toting Mainers. When Reggie turns on Kelly and hands him over to a doctor trying to cure people of their "disorder" for a large sum of cash, things take a dark turn for Cannibal Kelly. Where the first film is more of a straight body-horror style film, Eaters develops much more of a backstory for everyone involved, and fleshes out the tale to be more of a mad-scientist-meets-zombie-apocalypse-meets-government-espionage style flick...with gallons of blood and entrails for good measure. The dark, dirty comedy aspect of Eater is diminished in Eaters, the runtime instead spent developing the story as much as possible. White the entirety of Eater felt like the last 20 minutes of Society, Sleep Eaters feels more like a gorier, low-budget version of The Crazies. If abandoned asylums and isolated backwoods locales are your thing, then shooting a movie in Maine would be your utopia. Grant makes perfect use of his location, being able to move seamlessly from city to rural settings, and it really helps this film. There is a grand, sweeping shot of Kelly being led through a field to the abandoned asylum on the other side by the doctor's henchmen, and it's marvelous. If you've never visited New England before, the movie will simultaneously make you want to travel, and yet also stay as far away as possible. Cannibals, you know. I want to take a second to comment on the gore aspect of the movie. I have the pleasure of reviewing plenty of independent and underground films, and budget constraints are always an issue, especially when it comes to cast members getting bloody. Here, there's no shortage of buckets of gore. During the climax, with alarms sounding and lights flashing, the hospital becomes a bloodbath of cannibals, tearing each other apart. Flesh, entrails, bullets flying, and blood splattering all over, it's a brutal mess, and delightful for the gorehounds. As a whole, Sleep Eaters is a shining example of underground gore films that also took the time to develop a story and characters. So often we get one or the other - a rambling mess filled with bad actors, or a gorefest with no plot. 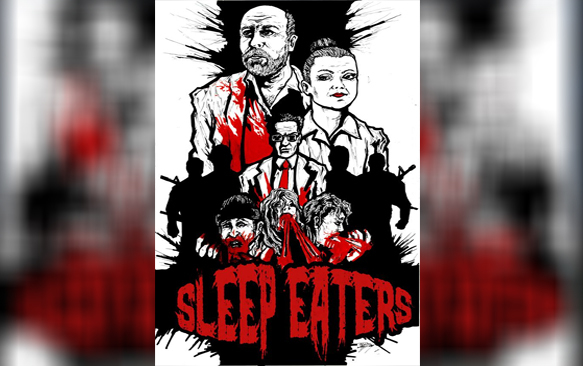 Sleep Eaters works on all levels, and is a deliciously good time. Tasty!